August, 3, 2016: George Maybee arrived here in Los Suenos at my condo last evening, we had dinner and got a good night’s sleep. This morning I cooked eggs and bacon, with toasted English muffins, along with awesome Costa Rican coffee for breakfast. We took a swim in the pool, got some vitamin D, and began to pack our equipment for my next Costa Rica Blue Marlin fly fishing school. At 2:30 PM after spending some time on the Internet and talking to my BFF, we left the condo and headed down to the marina. We boarded the vessel “Dragin Fly” at 3:00 PM where Captain James Smith along with mated Berto and Roberto were ready to cast off and head out to sea. At 4:00 we slowed to trolling speed, put out the teasers, then prepared the TFO BW-HD fly rods, combined with my Mako # 9700 BG fly reels, with RIO Leviathan 550 gr fly line, 20 pound test Mason hard class tippet, Cam Sigler pink and white popper, tube flies, with Gamakatsu 8/0 Octopus hooks, to be ready to fish. Sea conditions are large slow moving swell with 1 to 2 foot chop, overcast skies with 80 degree air temperature. At 5:30, in light rain we raised a sailfish, it teased in and George made a good cast, which sailfish never did bite the fly. At 6:05 it started to get dark, we took in the lines and finished our fishing for today. After a hot shower, we had a great meal with homemade lasagna and a fresh green salad, by 8:00 PM we were in bed and falling asleep. August 4, 2016: We woke up at 5:00 AM to the smell of fresh brewed coffee, with scrambled eggs and sausage, sunny skies and relatively calm seas and at 5:40 our teasers were deployed. The first Blue Marlin of the trip was raised at 6:10 AM near “Blue Marlin Destination-X-#12 (BMD-X-12). George Maybee made an excellent cast and that marlin gobbled the pink and white tube popper fly. The marlin took off at high speed and didn't stop for over 300 yards, then when it jumped the 20 pound class tippet broke and the marlin was gone. 6:50 AM we raised another Blue Marlin which did not eat George’s well placed fly, than at 7:01 another Blue crashed the short teaser, George cast the fly, and hooked a 3 pound Yellow fin Tuna, which he promptly caught to provide us with fresh sashimi for lunch today. Sunny and calm at 8:00 AM, Captain Chris Sheeder is fishing next to us aboard “Finest Kind”, good to see my friend here on this marlin bite. We raised one more marlin which did not bite and then another boat in the area began to live bait at 8:30 AM so we began to troll away to another location which is close to 30 miles from this spot BMD-X-10. 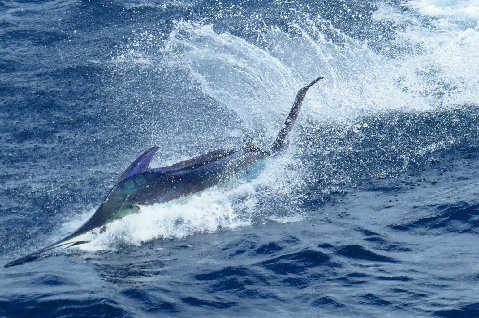 At 10:15 AM we raised a 200 plus pound blue marlin which pounced on the pink and white popper, tube, fly cast by George Maybee. At 10:41 AM Gorge wound the leader into the rod tip and then Berto released that awesome marlin without breaking the 20 pound IGFA class tippet; this was George’s third blue marlin on fly of his life. At 10:52 AM George hooked a Blue Marlin which looked to be between 350 and 400 pounds. That awesome fish fought valiantly, on the surface, putting on a display of jumps which were the best that I have ever filmed. At 11:23 AM George was 4 foot from getting the leader through the rod tip for the release when that monster made a beautiful jump and broke the 20 pound test IGFA class tippet. At 11:30 AM George hooked a red hot 140 pound Blue Marlin at 11:43 in the rain we release George’s second Blue Marlin of the day, and the fourth of his lifetime. During the next 15 minutes we raised 3 Blue Marlin, every time we made the cast a yellow fin tuna ate the fly before the marlin could get to it. Until 1:00 PM we raised no fish so we decided to troll back over to BMD-X-12, arriving at 3:10 PM. At 3:25 PM we raised a blue marlin which would not tease in for a bite and just faded away. 3:30 was time for some fresh caught Yellowfin tuna sashimi before the afternoon bite turns on. At exactly 6:00 PM we raised a blue marlin, it teased half way to the boat and then faded off, no bite. At 6:17 we pulled the lines out of the water, as it got dark, we deployed the sea anchor and settled in for the night. Dinner tonight was Pork chops with rice and red beans followed by ice cream and after dinner we went to sleep at 8:00 PM. The score for today was 11 Blue Marlin raised, four bit the fly, George Maybee caught and released 2 Blue Marlin on fly. August 5, 2016: Woke up at 5:00 AM to fresh brewed coffee with bacon and eggs for breakfast, applied sunscreen, then deployed teasers at 5:30. First blue marlin raised at 5:59 during sunrise, would not eat, then another blue at 6:37, also no bite. 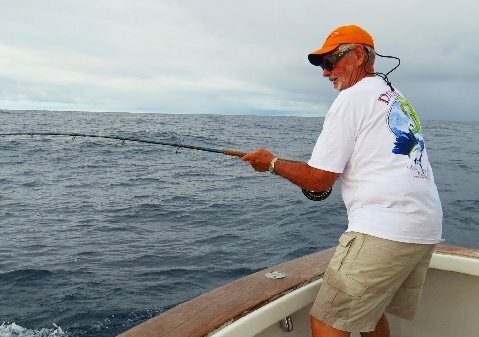 At 7:01 a hot Blue Marlin teased in for a good bite, George made a good cast and that marlin ate the fly. 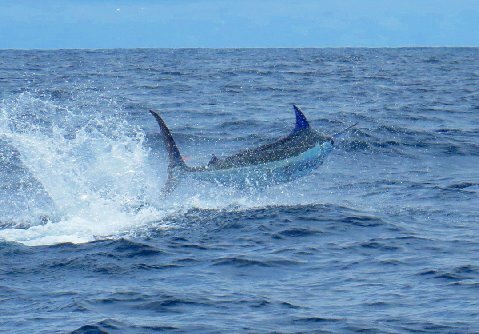 After ripping off 200 yards of backing, that marlin began jumping sideways, for some unknown reason the 20 pound class tippet broke after the second high speed jump. Between 7:30 and 8:30 AM we raised 5 Blue Marlin George got two bites, broke one off by palming the spool, and caught a 200 pound Blue after a 6 minute close in battle. 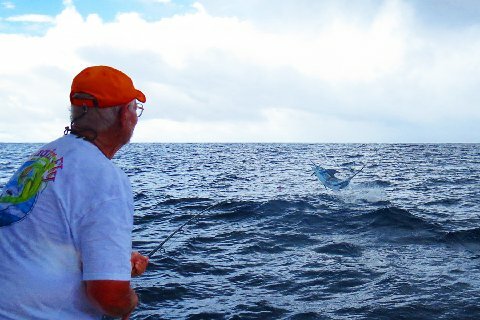 This was George Maybee’s third Blue Marlin on fly of this trip, and his fifth in his lifetime. We have been fishing around a floating piece of trash with sticks, floats, and net all tangled up for the past hour, and at 8:35 AM two other boats arrives and began fishing with live bait. During the next two hours we stayed in the area while the other boats caught a couple of fish, we however never raised another fish trolling. At 10:30 AM another boat arrived which made four boats fishing one floating piece of trash, 140 miles from land. At 10:35 we raised blue marlin which would not tease in, and then four minutes later we raised another marlin but that fish would not bite. At 10:45 two of the other boats took off for another spot and the other trolling boat hooked up right away to a blue marlin. At 12:00 we are all alone on that free floating FAD, we raised a fish which would not eat. We raised a Blue Marlin at 1:12 PM, George made a good cast and that 150 pound fish piled onto the fly. This rocket jumped continuously for 7 minutes, we filmed the whole thing, then after almost coming into the cockpit twice the fish stopped right beside the boat. George reeled the fish in and a minute later Berto got the fly back and released George’s second Blue Marlin on fly of the day, his fourth of this trip. At 4:00 PM we left the trash FAD and headed back over to BMD-X-12, arriving at 4:25, there were 3 other boats in the area. 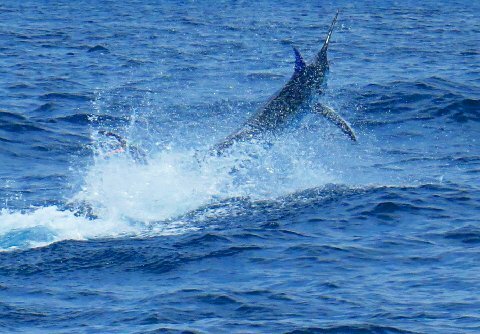 At 4:36 we raised a Blue Marlin which charged in and ate George’s well placed fly, then took off quickly and put on a spectacular jumping show. Finally at 4:59 PM Gorge wound the leader into the tip top and 3 minutes later Berto got the fly back and we released our third Blue Marlin of the day, on fly. This fish was estimated between 225 and 250 pounds, and like all of our fish it was caught on 20 pound IGFA class tippet. Then as the sun set in the west at 6:15 PM we pulled in the teasers and set out our sea anchor. The score for today was 13 blue marlin raised, seven bites, George Maybee caught and released 3 Blue Marlin on fly using 20 pound class tippet. August 6, 2016; Woke up at 5:00 AM as James started up the engines and Berto pulled the sea anchor while Roberto brewed coffee and cooked breakfast. We had drifted about 10 miles during the night so we deployed the teasers, got the fly rods ready and trolled back out toward BMD-X-11. As we approached # 11 there was three other boats on that spot so we continued on out to BMD-X-12 where two additional boats were fishing, gets pretty crowded out here on the weekends lately. At 7:01 AM we raised a Blue Marlin which teased into eat the fly which George had cast, as the fish came tight it was apparent that the fly line was wrapped around the reel and the tippet broke instantly. Seas are 2 to 3 foot chop, with overcast and light rain. At 7:29 AM we raised a double, one small and one big marlin, George made a good cast, the smaller fish ate the fly, and put on an awesome show, at one time almost jumping into the boat. After a 7 minute battle, the 100 pound blue marlin was about 120 feet from the boat, everything was going good until while backing up toward that fish, George palmed the spool and the 20 pound class tippet broke as the fish surged. Rain stopped, partly cloudy skies, 82.5 degree water temperature, air temperature is about the same. The next fish that we saw was a striped marlin which came up to the teaser at 9:45, it chased the teaser in toward the boat, however we could not get it to eat our fly. 10:01 AM Captain James decided to check out a couple more spots so we took off and ran for just under an hour, about 24 miles to BMD-X-6. 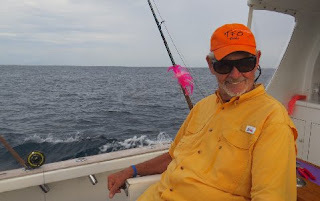 At 11:06 we raised a blue marlin, it would not eat the fly, then again at 11:19 we raised another blue marlin, George cast the fly and the marlin circled but would not bite. During the next 30 minutes we raised 4 more Blue Marlin, George hooked two of them, one was a small fish of 100 pounds or less, which we had several shots at catching but missed the leader by 3 foot, then on a long run it broke off from too much pressure. 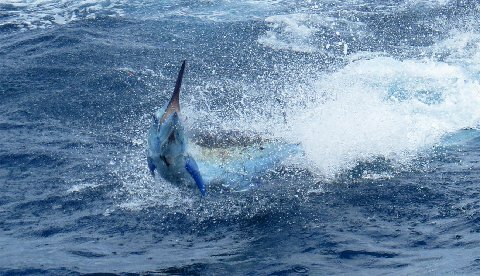 The other blue marlin put on a great show, stayed on the surface but again broke off from too much pressure being applied. At 12:00 noon the fishing is good but the catching is slow, we have not landed a marlin yet today. 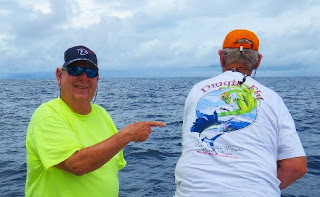 We raised a fish at 12:11 which ate the fly it came loose several seconds later, then at 12:20 George hooked a big marlin, fought it deep for 10 minutes, when it surfaced to jump 200 yards from the boat the 20 pound class tippet broke. We are getting lots of bites, just having trouble converting to catches. At 12:45 we raised a blue marlin, it did not eat the fly. We raised a striped marlin and 3 blue marlin between 12:47 and 1:20 PM however they would not eat the fly. We got several more raises until 3:00 PM then James decided to move to another spot, so we ran until 4:45 PM at the BMD-X-8. At 4:50 PM we teased a 90 pound blue marlin in range for George to cast to it, bam that marlin ate the fly, ran 60 feet then jumped and spit out the fly and hook. Georges marlin luck turned off after his fifth fish of the trip yesterday afternoon, still over an hour with lots of marlin around. We raised a couple additional blue marlin during the last hour, as the sun set in the west we fished until dark. The final count for today was 19 Marlin raised, 7 bit the fly, three of them came unhooked while we broke the 20 pound test class tippet on four Blue Marlin. As this “Costa Rica Blue Marlin Fly Fishing school” comes to an end George Maybee saw 43 marlin raised, he got 18 to bite his well placed flies, while George caught and released 5 Blue Marlin on 20 pound class tippet on fly. This trip increases George’s lifetime catch from 2 to a total of 7 Blue Marlin on fly. Congratulations to George! Tonight we had jumbo shrimp with rice and beans for dinner while we head back toward Los Suenos Marina Resort. At 3:30 AM we arrived at Los Suenos and returned to my condo and took a nap. August 7, 2016: Just looking at some video and pictures from this trip, I am publishing this fly fishing report from my log book with a few of the pictures taken with my I-phone and Cannon point and shoot camera. Thanks to George Maybee for doing a great job at catching Blue Marlin on fly, and to the following for your support: TFO Fly Rods, Mako Fly Reels, Gamakatsu Hooks, RIO fly lines, Dragin Fly sport fishing, George and Anna Beckwith, Captain James Smith along with his mates Berto and Roberto, the awesome Los Suenos Resort and Marina, along with all of my awesome clients, family, friends, and BFF, for making this awesome Job possible. I Love My Job, wish you were here. 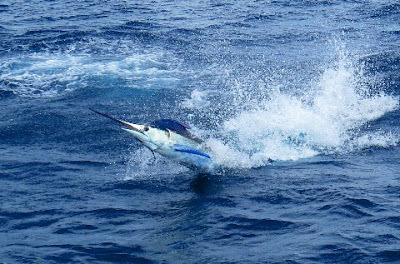 After seven, three day Costa Rica “Blue Marlin Fly Fishing School” sessions we have caught and released 35 Blue Marlin and 9 Sailfish on fly, all on 20 pound test IGFA class tippet. Stay tuned for more fly fishing reports to follow soon. Raised 7 billfish yesterday, 2 of them blue marlin. Unfortunately we sancochoed one of the marlin and jumped the other one off. Both our anglers did get a sailfish release so still not a bad day of fishing. Off to the seamounts today.